A Insider Look At J.B. Hunt Transport Services, Inc.
J.B. Hunt is one of the largest transportation logistics providers in North America. It started out with just five trucks and seven refrigerated trailers in Stuttgart, Arkansas on August 10, 1961 where their focus was on using rice hulls for poultry litter. Their business grew over the years and in 1969, they added another branch to their business. In 1983, the Hunts sold their rice hull business to focus solely on growing their trucking company. Over the next decade, the company grew 2,000%. In 1990, the truck company moved its headquarters to Lowell, Arkansas. J.B. Hunt Logistics Inc. and J.B. Hunt Dedicated Contract Services formed to meet customers’ logistics and outsourcing needs. Then in 2000, J.B. Hunt Logistics merged with six other logistics units to form Transplace, the country’s leading internet-based supply chain management company. J.B. Hunt serves Wal-Mart, Target, Best Buy, and Anheuser-Busch plus many other Fortune 500 companies. There are many career opportunities at J.B. Hunt. Drivers at J.B. Hunt can have their choice of local truck driving jobs, regional trucking driving jobs and over-the-road driving jobs. These jobs offer stability and the opportunity for you to grow and prosper. They are committed to giving the professional truck driver a better quality of life with frequent home time and strong annual earnings. J.B. Hunt knows that it takes more than just great drivers to keep J.B. Hunt at the leading edge of the transportation logistics. They realize that to be the best you have to hire the best. J.B. Hunt hires exceptional people with exceptional talent and provides effective training and development opportunities and challenges their people to excel. J.B. Hunt has a place for internships, recent graduates and professionals in their offices. J.B. Hunt’s Intermodal segment leads the way in engineering transportation solutions. They operate the largest fleet of company-owned 53’ containers and one of the largest private drayage fleets across a nationwide network of rail partners. J.B. Hunt’s Dedicated Contract Services has the equipment necessary and the expertise needed to provide unsurpassed solutions. DCS are customized with guaranteed capacity, industry-leading service levels, optimum efficiency and cost-savings management. J.B Hunt operates one of the largest nationwide final mile cross-dock networks that include 80+ locations that total more than 900,000 square feet of space. J.B. Hunt has refrigerated trucks that are capable of handling all of their customers’ temperature-controlled needs. Offering LTL, cost-saving intermodal and a variety of lightweight refrigerated equipment, J.B. Hunt can offer the most diverse solutions. 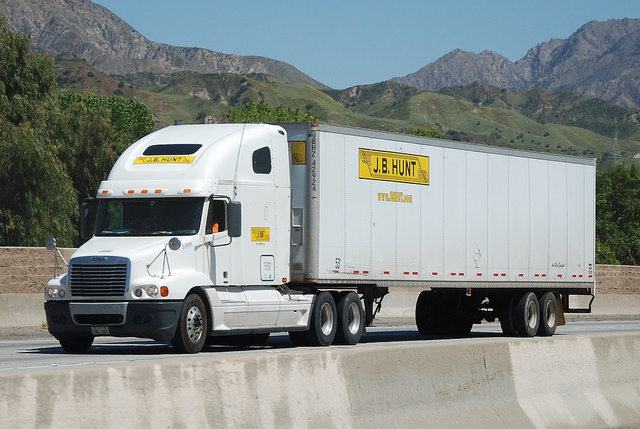 J.B. Hunt offers truckload service that is safe and reliable providing capacity oriented solutions centered on delivering customer value and superb service levels. J.B. Hunt utilizes their LTL (less than truckload) solutions to maximize carrier procurement, network design/optimization, freight routing, tracking, proof of delivery, bill of lading preparation, carrier payment, reporting and analysis. J.B. Hunt is able to meet all of your flatbed needs. They have thousands of carriers and company-owned flatbed and curtain side trailers. They have everything from standard decks to step decks to low boys to multi-axle and heavy haul trailers. J.B. Hunt is committed to maintaining a partnership with their communities and sharing economic benefits with the people they live and work with. They take pride in putting safety first and comply with all state and federal regulations. J.B. Hunt is dedicated to maintaining working conditions based on mutual trust and respect by encouraging open communication throughout all levels of the company.